Maybe it was relief after Friday's vicious expiry-led sell-offs on both side of the Atlantic. Maybe it was the recent game of He-said, She-said from Williams, Bullard, and Lockhart that brought balance to the (monetary) force. Either way, yesterday was a damn sight calmer than it's been as markets appeared to realize that the Fed might not be on hold forever, after all. One area of fallout from the dollar's modest recovery has been in Brazil, where the dollar's strength has been anything but modest. USD/BRL is knocking on the door of 4.00 and is at record highs. If it weren't obvious, the weakness of the currency is creating a negative feedback loop for the economy and policy. Until that loop is broken, Macro Man will find it very, very difficult to become bullish on Brazilian equities, no matter how cheap they appear to have become. At 9.5%, inflation is at its highest level since 2003; given that the BRL has depreciated a further 10% in the month since the last inflation figure, it's difficult to see the inflation trend going anywhere but up, especially once more time passes and a wage/price spiral sets in. To be sure, Bacen has responded with rate hikes this year, and at 14.25%, the SELIC rate is the highest it's been since 2006. To put that into context, however, when the SELIC was last at these levels, CPI inflation was just 3.7%...and falling. The current real SELIC rate of 4.72% is extraordinarily high by global standards- indeed, very few countries can boast of a nominal policy rate that high, let alone a real one. 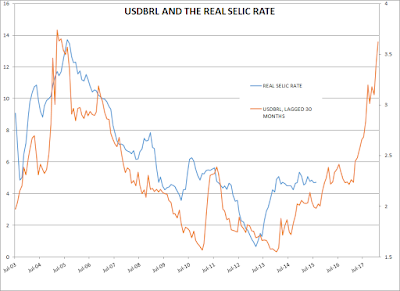 However, by Brazil's own standards it remains fairly low- since 2003, the average real SELIC rate has been 6.55%. 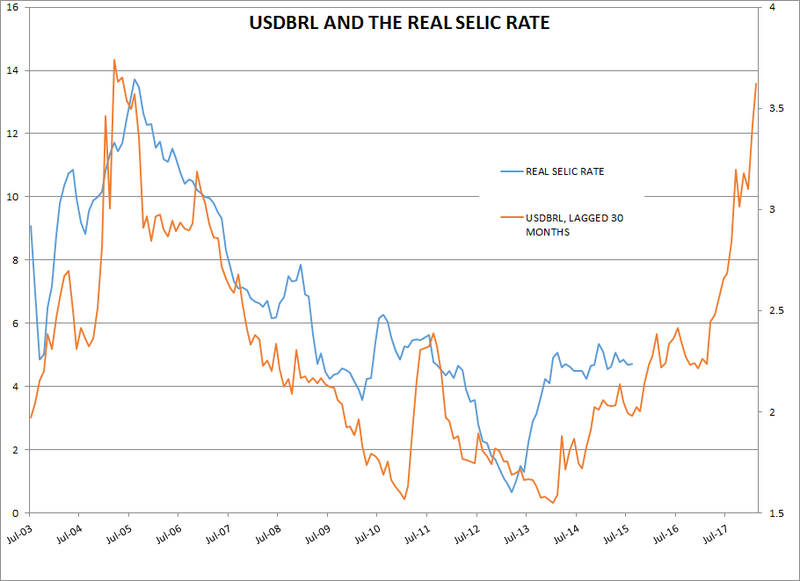 Moreover, during prior periods of abject currency weakness, markets eventually demanded double-digit real rates as a sufficient risk premium to put money into the BRL. Needless to say, double digit real rates do not exactly engender high multiples for the equity market. Even with the recent sell-off in the Bovespa, the expected earnings yield of Brazilian equities is some 6% below the short-term cash rate, which doesn't exactly scream "buy me", does it? would face the overhang of expected higher real rates until well into 2018. That's not to say that the Bovespa will tank in a straight line for the next two and a half years, of course. What it does suggest, however, is that there are likely to be easier fish to land than the one that lets you buy Brazil just before it embarks on a secular bull market. On another subject, it would be nice to hear what MacroMan thinks about the VW emissions fraud. It is a fraud. Said that, considering that VW engineers are among the best of the planet (you know I know a few of them... they are), I wonder if that wasn't a normal practice among car manufacturers. That could be a massive scandal. I know that many cars also had firmware that detect yhe pattern used for sound level tests too. Other interesting fact.. the reason most cars have twin exhausts on opposite sides is solely due to reducing detectable sound in the tests. Tbh.. i personally don't care if my car emits more than it's published bandwidth of pollutants but the tax man sure does. If UK car tax bands, which are dependent on emission levels, have been defrauded then HMRC can take them to the cleaners. And yes, it's niaive to think just VW were up to it. Of course US companies too but I do sniff the US protectionist bias fines kicking in. The real scandal in my mind are the mpg figures published. Unless you weigh 10kg and are driving downhill in a vacuum on solid tyres they appear unachievable. But as for Brazil. Errr.. yes! Perhaps they could use the euro. Last time I went there (summer) I paid 800 BRL for a day of Robalo fishing and the guide was overbooked (and it was nothing fancy, mind you, just a day out for your upper middle class brasilian). If Dilma is not impeached, the time to get long EWZ will be ....2018/1019 scale up as MM said; the elections of 2018 will show the world that the PT crooks will be replaced by much more subtle crooks; the PT has wasted all of Cardoso's good work (Lula was just benefitting from a once in 50 years configuration). Look, VW has been naughty boys here, but when history is written on this, the key mistake will be that they rolled over (probably in order to save the brand etc etc). There's no way back now ... they admitted to it (jeez, never admit to anything!!). Of course, everyone else did it. This issue is like a 1-for-1 reflection of Polemic's point that it is nigh on impossible to reach advertised MPG figures. 1) Doing this (i.e. admitting) in the U.S. is suicide given the regulator's propensity to really(!) throw the book at you. 2) Re Polemic; other countries now get a free pass to stick the trunk into the coffers at Wolfsburg. If they had gone on the offensive .. i.e. saying something like. Huh? everybody knows this, our cars are the among the best and cleanest in the world, it would have changed the story. They would still be spiked, but much less so. Doing it in the first place is a case of bad corporate governance; the handling of the fall-out is a case of catastrophically poor corporate governance. Oh sorry for highjacking, where are my manners! On Brazil; I think MM is broadly right. This could stink for a while. But we have to consider the following. How long can you have a spread between -ve rates in the EZ, ZIRP in Japan, and a dithering Yellen and the carry on offer in Brazil? Maybe for a while longer, but when it turns, it will be the carry trade of a life time. Think spread compression in the EZ periphery! Anything hawkish is a big problem for EM. Too dovish is a big problem for Europe/Japan. Any thoughts or esoteric ideas? I find it weird that Volkswagen manages to be the bearded lady in a vaudeville act for global equities at interesting junctures - remember the equity-arb blow up for hedge funds in october 2008 re: the porsche deal when VW rallied around 500%? October 2008, of course, later proved to be the bottom of the cycle for EM, with Mr Hope soon coming to power in the US and the Chinese Govt then pulling an Oprah on credit for infrastructure projects. As I mentioned in a post yesterday, I cited the example of BP - I think its a good analogy for VW, and would tempt one to wade into the stock with small size on the premise that the first reaction is not likely to be the final one - the key difference, of course could be that in June 2010, the oil cycle was very much on an upswing, and there were actual buyers of commodity stocks (yes, they used to exist!) - the biggest issue for all these carmakers may yet turn out to be a flattening in global demand as everyone realizes that the recent pace of car sales in both the US and China would be tough to extrapolate. As for EWZ, I agree with anon 10:38 that a single digit bottom may lie in its future - however, Dornbusch's law would suggest we will be there way before 2018 - how about in the next 3 months?? Doesn't help that German carmakers were already under the cosh due to China. As far a product goes VW is hard to surpass (yes I own a few of their vehicles) and I won't stop buying them on an NO2 rigging argument. But today's price action in everything is UGLY and I am trying to filter out what is Fed, what is background trend and what is VW noise. As with all big sell offs it tends to be a combination of factors being blamed but at the heart of it is general fear. But Brazil. yes. Nice cocktails and well adorned beaches. Since going there on a financial field trip to visit policy makers 10 years ago I have lost a grip on it, so any informed comments from MM and comments are appreciated. Anon@ 12.02- are you benchmarked against an index, or cash? But my original question was specifically on Govvies. Not credit, not floaters, and actually not linkers. I have to put 10% in gov bonds. Thanks for the note on Brazil, MM. I'm surprised you got through that lot without mentioning China, which is making it all worse. 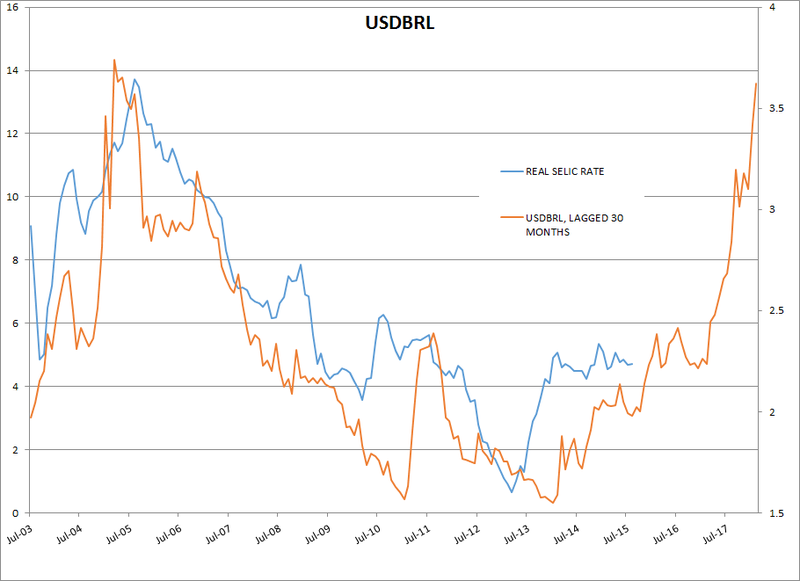 If and when China markets and CNY stabilize, BRL may be done falling, no? Like CV, I really have to fancy a Brazilian disinflation trade in the future. The govies will lead equities, just as in the European spread compression trade, but the beneficiaries of such a move are not hard to spot. I did hope someone would get the pun (and considering the heated words exchanged lately I hoped to alleviate the mood) but you did put it in words much better than I would ever have, expanding on the intended meaning (as a poor excuse english is not, as u probably noticed, my first language). @ Anon 12.02- Well, if you are stuffed to the gills with riskier stuff elsewhere, on a portfolio basis I would think that it makes sense to find the govvies that are most -vely correlated with it. My guess would be longer duration type stuff. As an individual trade, it might make no sense at all given current levels, but I prefer to look at things on a portfolio, rather than trade-level basis. As for tail hedges, after the last month you won't find very much at all that's cheap. You could certainly argue that buying USDCNH is cheaper than buying $ calls, especially as the gap to onshore has largely closed. Of course, if the authorities decide to keep it closed, well, that's a bit of dead money. My personal bugbear tail event is a liquidity meltdown in credit, so that's where I'd prefer to look for cheapness. Maybe way out of the money 1 x 2 put spds (buying the 2) in HYG? CV I have a problem with the underlying cynicism of your post. I have asthma and I take issue if the exhaust pipe in front of me pushes out 4000% more particles than it should because they want that extra 5 kw in marketing brochure. Public health is at stake here. Respiratory illnesses are dangerous especially to children and elderly. As i'm not an fx man, i wonder if anyone has any thoughts on an esoteric sov yield (any part of the curve) where the FX has a reasonable chance of staying flat. perhaps China is bizarrely the best candidate?! Well, this is very interesting, Spoos seem to have resolved on the downside after a bit of chop, breaking below 1950. They even offered the classic breakout re-entry. This has me donning my plunger boy suit and hopefully I will not sustain any spinal injuries. On Brazil, did they not have to defer the last 2 government bond auctions due to lack of fill at a reasonable price ? I am waiting for Dilma impeachment, government cds spike or outright default before buying Brazil. CV, LB: yep, the EM carry trade will be good when it presents itself. However, I would say PMs have been caught along with the commodity complex in the USD bull / EM crash fallouts. I do believe that the monetary dimension of Gold (which is undeniable as 5 to 10% of available supply is currently accumulated yearly by CBs) should warrant a Gold premium which is not fully priced in my opinion. Commodity taken to the woodshed. Those participated in glencore cash call hurting today. Feeling of capitulation around the corner? Aussie looks pretty stable given the context. Brazilian equities? Why? Locals just buy inflation protected bonds. Very hard to beat, IMO. But there are some PE firms scooping up some shares in Brazil, it is coming slowly. I am quite aware of the situation in BR and it is probably 90% political at this point. Sure the economy is in the shitter but most of EM FX has stopped going bonkers. Either way, the best bet is almost surely USD bonds of say BANBRA or Petrobras. Did Russia default on Dollar bonds? has Venezueal defaulted (yet)? Even argentina, only defaulted on one issue and is still paying on all the other stuff. Why? Bc rich south americans are the majority owners of all this paper. The governments dont want to default on themselves. For the chap running family office money, take a look at these ones. Speaking of capitulation, let's leave VW aside for today, never a good idea to buy the worst stock in the index on a down day! Wait for that one, it just might be a BP situation. VW is the definition of German TBTF. Too many jobs, just like GM. Speaking of BP, punters are capitulating in that name, also Lukoil, rumours of possible dividend reductions ahead? Remember that by the time they announce it is usually Buy The News. There are some nice babies out there in the bathwater today. Hate to play CB bingo again, but it's time for more easing, just not by Janet, and right now the Draghi put is arguably the best trade out there. European equities are sporting a fat dividend yield that isn't easy to replicate at the moment, and monetary conditions are as loose as can be. Look for some nuance in the language about potentially accelerated purchases by the ECB? First off, apologize to Anon @ 1:36 for my cynicism, but I would submit here that VW cars are probably some of the cleanest and most efficient in the world. The rest is just some white coats deciding on what is an 'acceptable' level of pollution. I am stunned that so many words are being wasted on VW. What is the mindset here when massive banker frauds are met with silence? The mindset is that regulators haven't got the slightest bit of interest in pursuing the worst kind of wrong doers; they only have interest in pursuing those that are easiest to catch, and punishing them well out of proportion with the societal cost of their malfeasance. Not to derail too much either but the "everyone was doing it" wrt VW is just not true (or at least not supported by the current facts). The VW issue was discovered by a 3rd party checking EPA vs tailpipe on a wide range of vehicles and the VW's were a massive outlier. That alone should be enough to dispel the idea that "everyone was doing it". Biotech was leading equities and risk on the way up. Something has changed. @MM 1:03 PM - I see the "programming note" doesn't apply to blog owners/moderator's then? You & Nico make such a charming little double act lol. what changed was that some 32 yr old clown whose net worth is 50 times anyone else's on the board felt he would be able to sneak in a 5000% increase in a specialty drug price, in this political environment, with no repercussions - happened on the same day people concluded VW is a complete crook, thusly joining the ranks of the big banks and oil companies. The logical next shoe to drop would be the discovery of a major accounting scandal at a tech giant, and the only judicious investment would be in pitchfork manufacturers. Funding currencies (EUR and JPY) not following Equity risk.. so yes something has changed. Selling off ahead of Yom Kippur, thats all ;-) . sry that was in response to T's comment. @ Ghost One of the benefits of founding this blog nine years ago and providing free content of reasonable quality, plus a forum for discussion, is that I get to make the rules and enforce them as I see fit. If you think a gentle joke is worth moaning about, what can I tell ya- the door is that way and your refund cheque is in the mail. @ FT re: gold. I cleave to this view and would suggest that the monetary premium that you identify is already well in the price. I was thinking "everyone was doing it" in terms of cheating on firmware/writing poorly tested crap/getting away with safety violations. I would agree, it seems that nobody else is 'getting away with this' in terms of Diesel emissions. It does appear that VW decided to pursue a strategy of hoodwinking regulators - and they succeeded at it for a long time. It took a third party doing measurements to actually discover the issue. My point is that there are other things - like how the car controls software behave under a variety of real-word inputs - that are largely untestable/unauditable by third parties. That's where the real dragons are. And yes, I agree with the sentiment here that VW is being punished severely after cooperating with regulators. Great job in encouraging cooperation from the only people who know the details of what is being regulated US Goverment! May I suggest investing in Asia entertainment content providers? It has grown rapidly since 2014 and has huge potential for the next two years. FT/MM - I don't know which way gold will go, but the gold/oil ratio tells me that a mining operation started today would print money - therefore, GDX is a way better bet than the underlying on the way up (assuming there is one), but only after the rubble of bankruptcies has been cleared away. That said, the gold aficionados' main argument has always been that it is an alternative currency, therefore its value should be linked to either some kind of a CDS on central banks and/or the size of their balance sheets put together. The problem is that now, uniquely, we have an alternative to the alternative, and its called bitcoin - to the extent I am happy to piss away 2% of my portfolio to the diversification Gods, its not clear to me why I should prefer one to the other. @ signalman What's really surprising is that what we're talking about is the automotive equivalent of HFT. I'm surprised the EPA didn't go after some bugger who builds kit cars in his parents' garage instead. wash: u might be right re bitcoin, however, I'm happy to be a little too oldschool to venture into it....after all, unless I'm mistaken, it's a case of "it's rare and difficult to create/ acquire and its acceptance as a medium of xchange is spreading"
re monetary premium: I think it's not fixed but a function of CB's credibility (or as wash puts it, a CDS on CBs). My contention is then that CB's credibility is reaching new lows....hence the risk premium should rise (but, granted, it's difficult to quantify especially in a strong $ / weak commo environment). All in all, a gut feeling....but I agree GDX should outperform the underlying. Ecb QE Isn't working. There's been a psychological shift in equities. I don't QE can change that. Not this time. First time in a while bonds & USD did as they should while equities dumped for multiple reasons, Clinton, VW, commodities note, retail in UK. How will German economy standup to a slowdown in VW, suppliers etc? See the CAT & JCB numbers? China & EM slowdown will feed into EU regardless of QE and EU will be basket case with refugee crisis. If not, look out below! well a few days ago i was advocating buying eu over spoos....and then the autos happened !! !still think you need to see throughout the noise here and given upside is huge trade size doesn't have to be massive....i think eu equities will re rate substantially vs spx...have put this trade in the "long term drawer"
@anon 730..sure , what i meant was we are getting a rester of lows but vols much lower( strike for strike ) than before and no reaching for options- makes we feel we fairly close to a tradable rally....i have stuck my hand out for some on eu close! In some ways bitcoin is better than gold - it is 'harder' in the sense that the supply is fixed. It can also be 'teleported' worldwide without state involvement. The main 'risk' is the fact that the idiots who are maintaining it now might screw it up. Funnymoney or her ghost, you are either infatuated or get something out this blog...else you wouldn't be around here so much! China in focus again overnight. Lower lows likely in the morning. LB has indeed left the hammock and is perusing many charts with interest. We are already long boatloads of domestic REITs, thinking of adding to Europe and emerging markets tomorrow. Gold miners are interesting, but we'll wait a few days until EURUSD has stabilized after what we think will be another stumble. Tomorrow should be interesting. Am adding to UK, German, Italian and Spanish markets and a few Russian stocks. Agree with Leftback that gold miners are starting to look interesting.